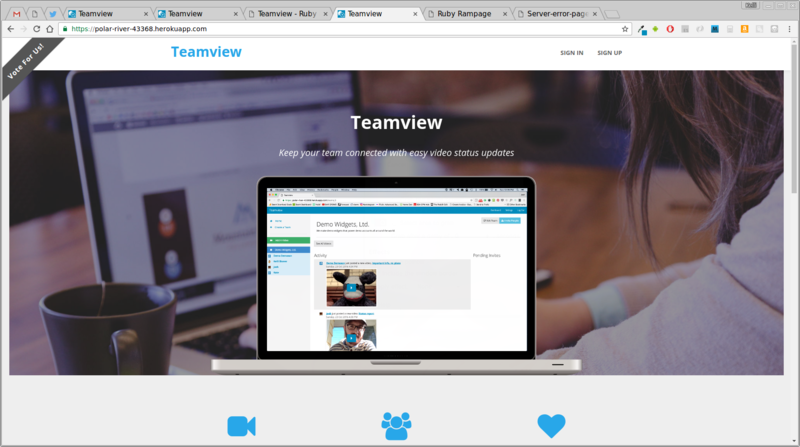 Teamview helps remote teams stay connected by allowing them to record and share short videos. - Here's a quick run-through of the app! 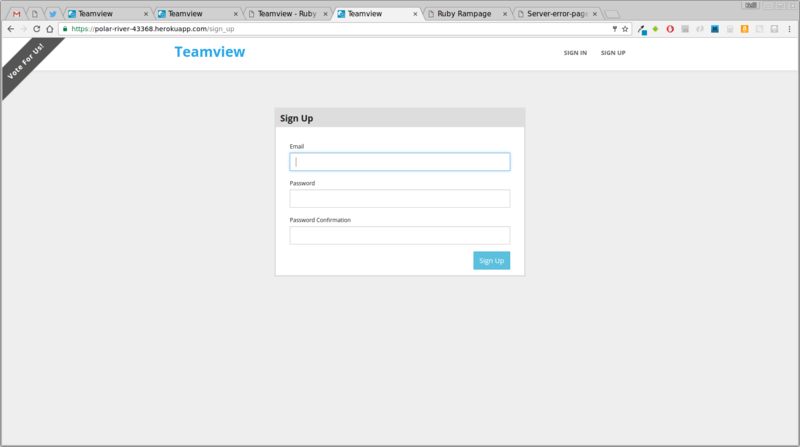 The Landing Page Once you arrive at the Teamview landing page, you'll see a list of features and be offered the chance to sign up or log in (if you already have an account). Login Screen Existing users may log in here. 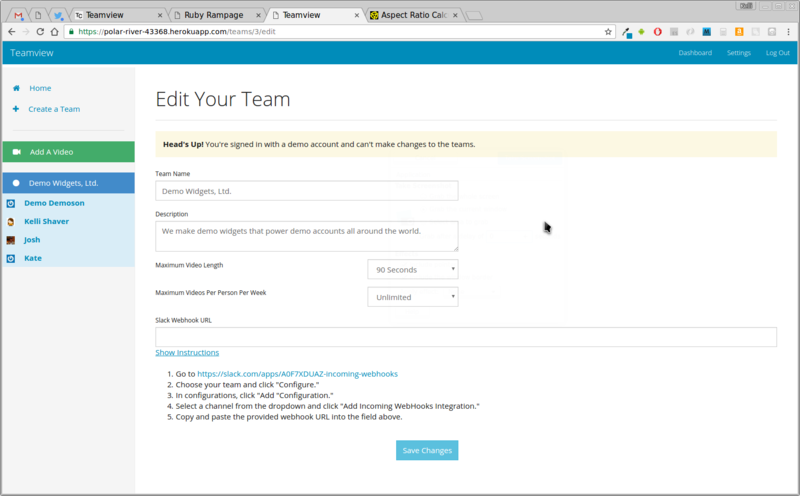 During the Ruby Rampage judging period, there will be a demo account available. If you don't wish to create an account, this is a great way to get a feel for the app - but do note that some features like saving data isn't available in the demo. Signup Screen If you'd rather, you can create your own account! Account Settings Once logged in, you can edit your account details by going to the Settings link in the top menu. 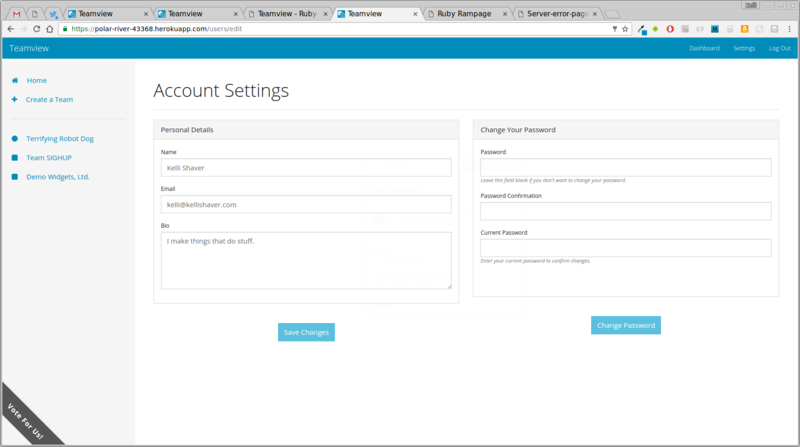 Dashboard The default screen upon logging in is your global dashboard. This shows you the latest activity (sorted by time) from all teams you're a part of - either as an owner, or a member. 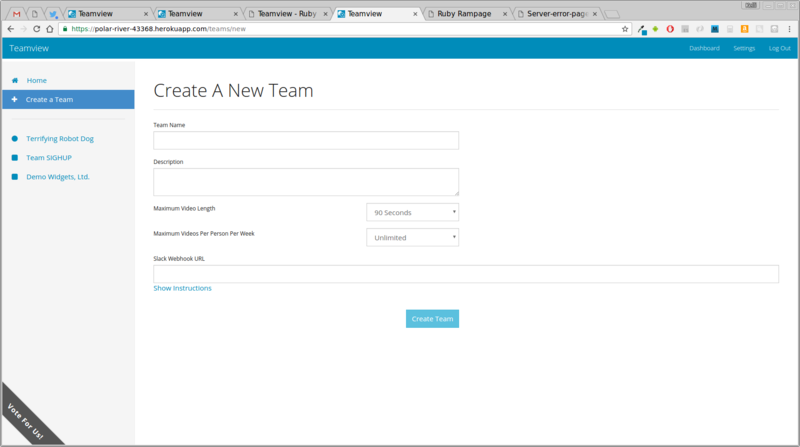 Create A Team To get started creating your own team, click the "Create a Team" link in the left sidebar and fill out the form. 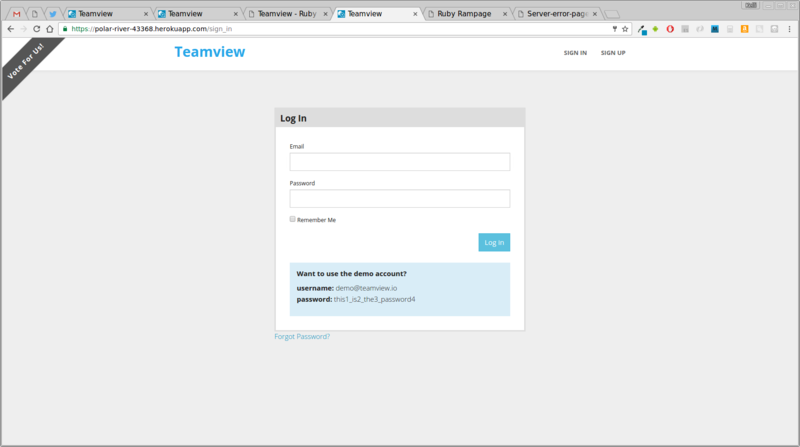 Team Dashboard Once your team is created, it will have its own dashboard. 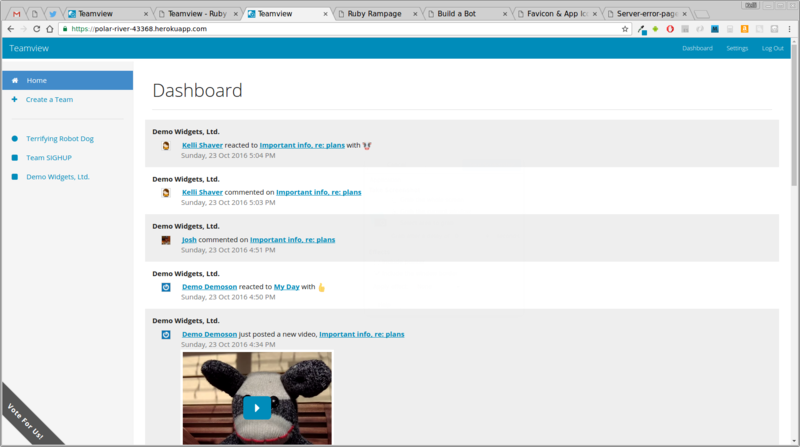 This is similar to your global user dashboard, but contains activity only from within that team. 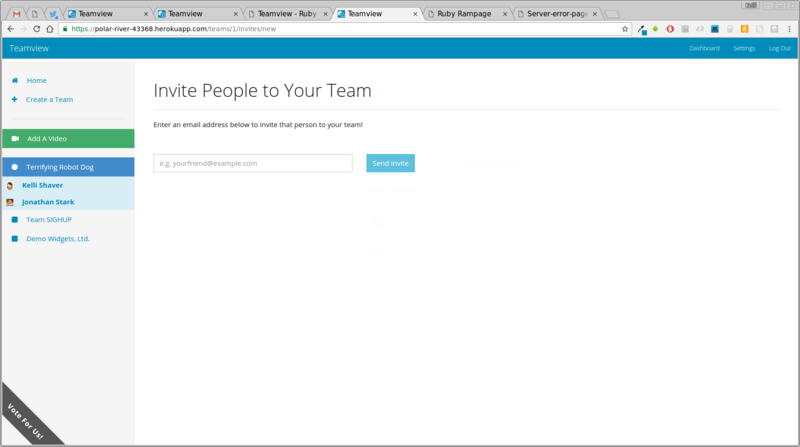 Invite People Now you can invite people to your team by entering their email address on the invites page. 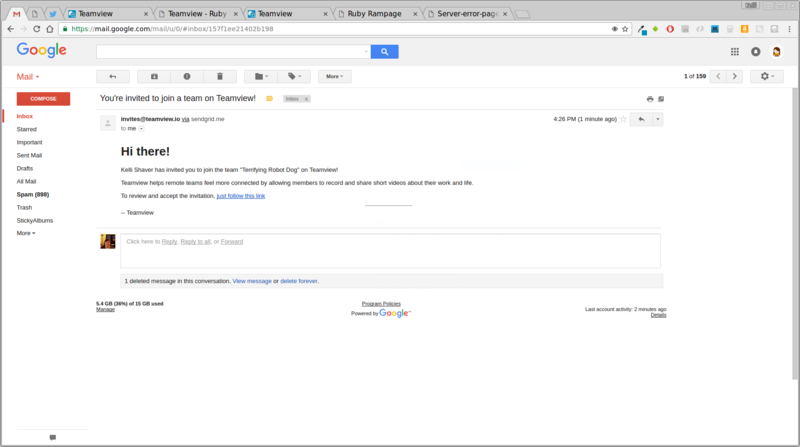 Invite Email Within a few moments, they'll receive an invite email, like this! 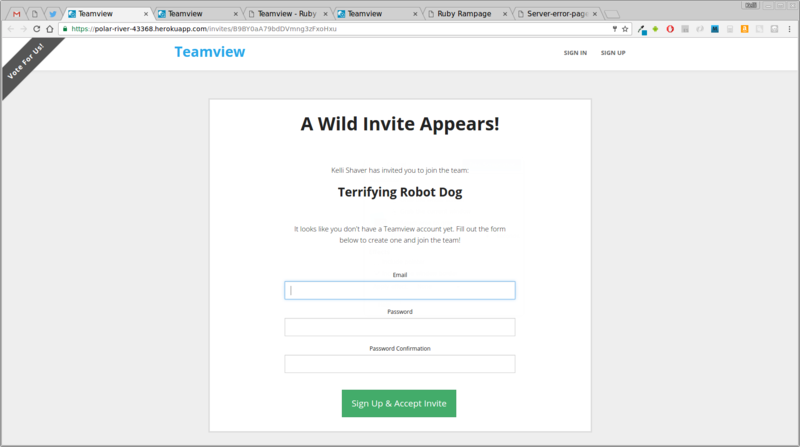 Review Invite - Existing, Authenticated User If the person you invited already belongs to Teamview and is logged in to their account, after following the invite link in their email, they'll see an invite page like this one. 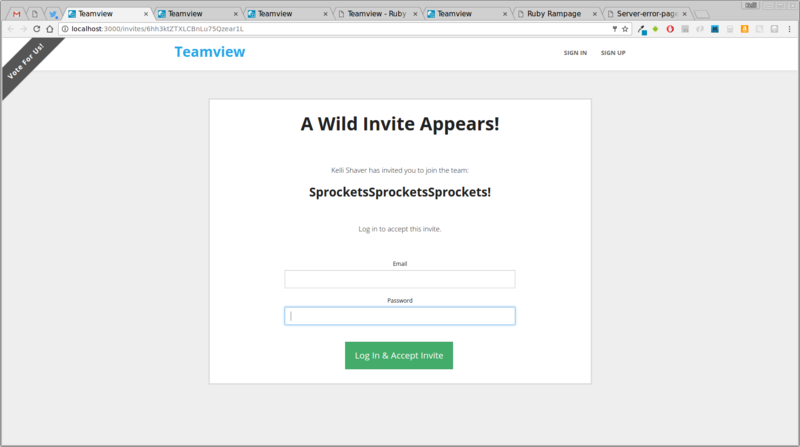 Invite - Existing, Unauthenticated User If the person has a Teamview account but isn't logged in, they'll be prompted to log in to accept the invite. Invite - Not A User And finally, if they don't have a Teamview account yet, they'll be able to create one and accept the invite. 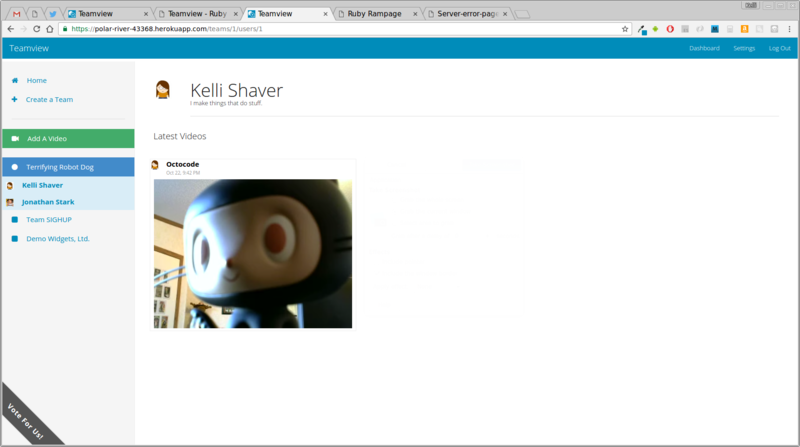 Record Videos Clicking the big, green "Add a Video" button from your team dashboard (or anywhere else within a team) will take you to a screen where you can record your video, using your computer's webcam. 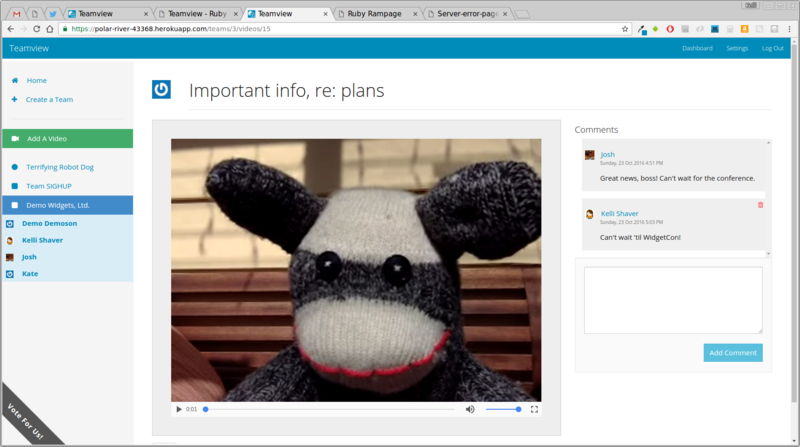 Watching Videos Clicking on a video from your global dashboard, team dashboard, or member profile page will allow you to watch and comment on a video. 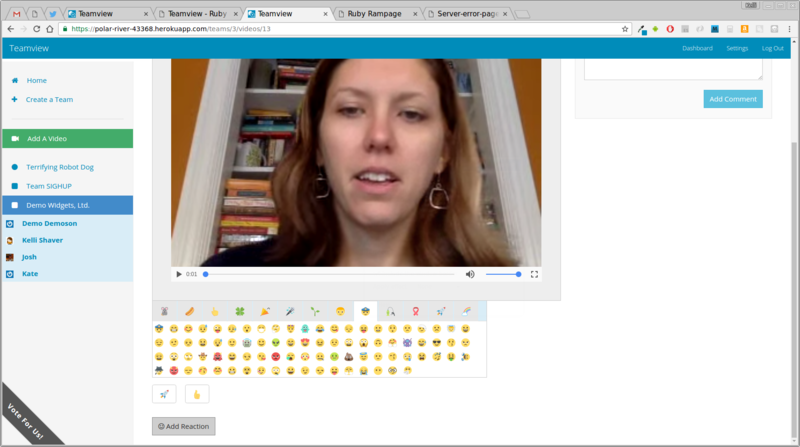 Add A Reaction If you don't want to comment, but still want to provide some fun feedback, you can react to a video with an emoji. 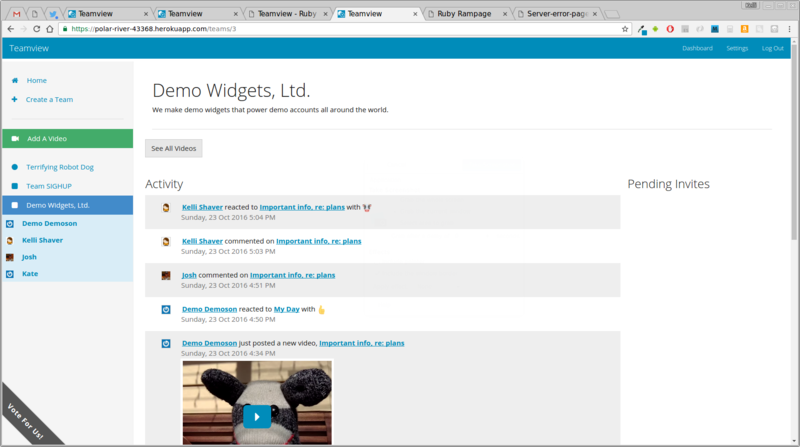 Team Member Videos You can also click on a team member's name from the list in the sidebar to view their videos. 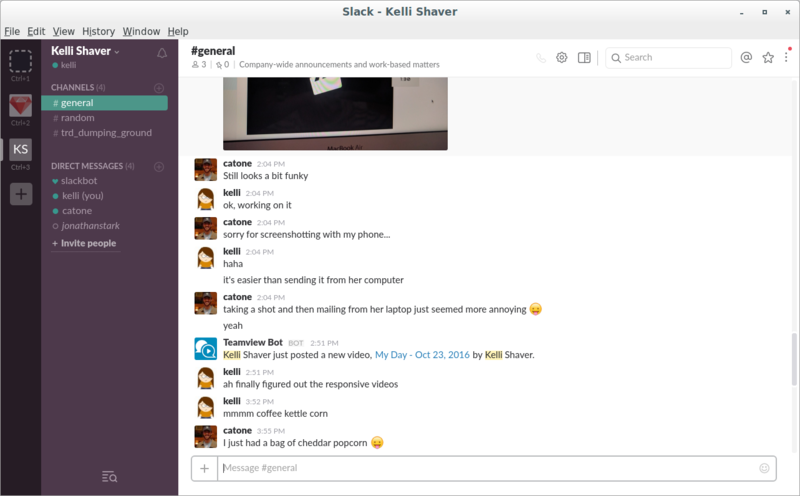 Slack Settings When creating or editing a team, you can provide a Slack webhook URL that Teamview will use to provide notifications whenever there's team activity, like posting a new video, leaving a comment, or a reaction. Message Delivered! 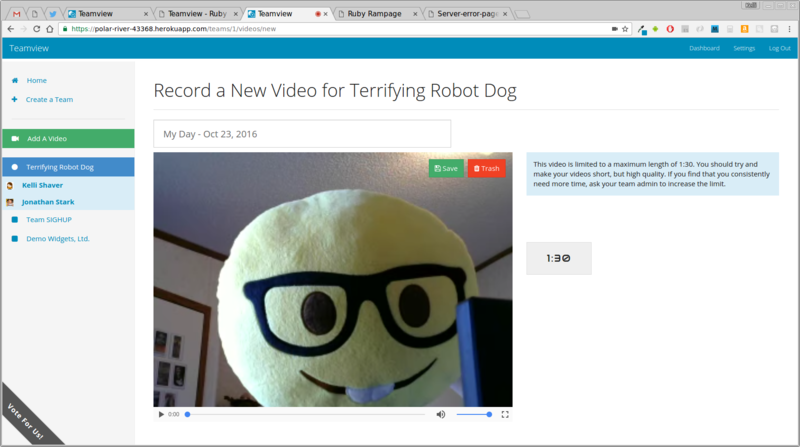 These messages will then appear inside your Slack. 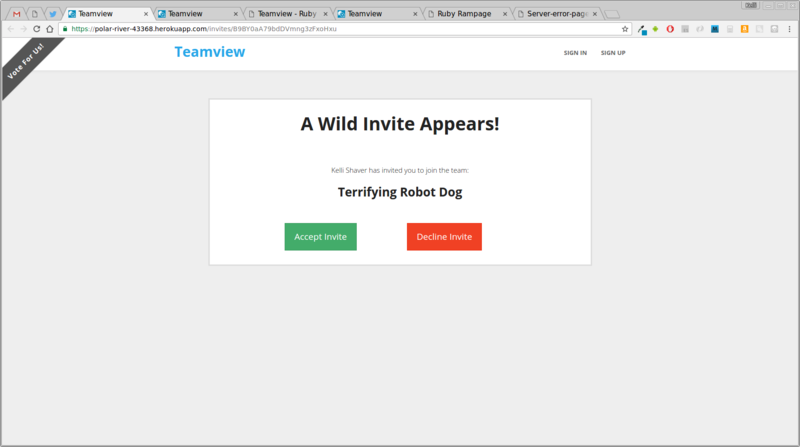 If you'd like to vote for Teamview in the Ruby Rampage, use this link right here to do so.